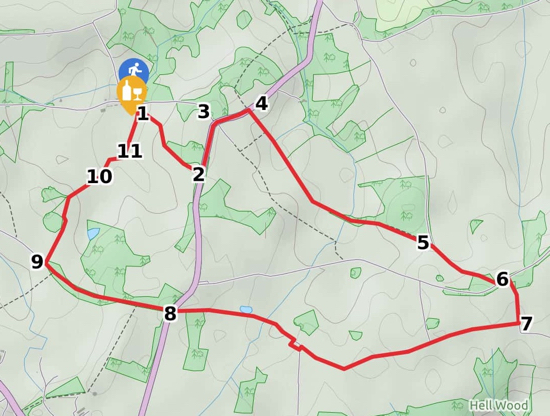 A circular walk starting and ending at The Woodman, Wildhill taking in some old byways and a ridge walk with great views. Involves a section of lane walking with a short stretch without a footpath. Park in the car park at The Woodman, Wildhill, and head for the gate at the south-east end of the beer garden. Enter the field and walk diagonally uphill, heading south-east until you come to a gate in the hedge. Go through this gate, cross the next field, go through a third gate and, keeping the woodland to your left and the field on your right, follow the path as it continues south-east through the crop to the hedgerow and out onto Kentish Lane the B158. Cross the road with care and turn left, walking north along Kentish Lane until you reach the bend. Just before the bend, cross the road a second time at a point where you can see and hear the traffic - cars take this bend at speed, so extra care is needed. Continue walking past Wildhill Road on your left and continue on the left side of Kentish Lane as it heads north-east until you come to a track on your left just before some cottages. At this point, cross the road a third time and head south-east down Hornbeam Lane until it reaches a stables on the left and a large house on the right. Here Hornbeam Lane becomes a path. Continue along the path as it heads east alongside and through the edge of Nine Acre Wood until it emerges on Cucumber Lane. Turn right on Cucumber Lane and follow it south-east until you reach Tylers Causeway. Turn left on Tylers Causeway and walk north-east a short distance until you come to a track on your right with a lodge on the east side of the track. Follow this track due south until you reach a footpath on your right just before a bend. 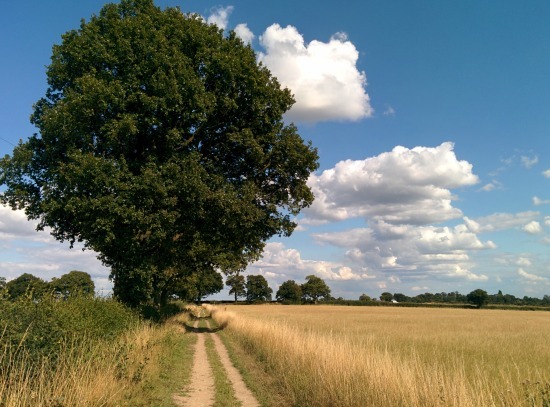 Take the path and head south-west along the track, past Barbers Lodge Farm, then Woodfield Farm (where you have to walk to the left of the large black barn), and eventually emerge on Kentish Lane, the B158. Cross the B158 and head west along Grubbs Lane walking on the footpath on the left (south) side of the lane. At one point, for about 100 yards, there isn't a footpath along this road and you have to take extra care. Best to walk single file and look out for idiots driving at speed down and up the dip along this short section. This can be particularly bad at rush hours because this lane is a bit of a rat run from Hatfield to Essendon and Newgate Street. 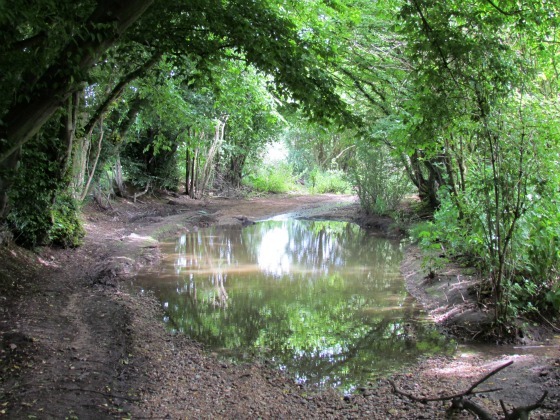 After climbing the dip, look out for a footpath on your right, just after Westfield House, heading north across the fields. Take this path to the end of the field where you will have wonderful views over to Wildhill. At this point you will have the woodland on your left and fields on your right. Go through the gap in the hedgerow just to the left of a tree and cross the next field slightly diagonally north-east aiming for the hedgerow. Note: At times this path will be overgrown with crops, although the landowner is usually good in making sure that the path is clear. If the path is blocked simply follow the edge of the woodland on your left and you will rejoin the path. Keep walking with the field on your right and the hedgerow on your left until you reach the end of the field. There will be a track off to your left heading north. Don't take this, it's not pubic. Instead, turn slightly right at the end of the field and immediately look out for a gap in the hedgerow. Turn left and head north-east alongside the next field with the hedgerow on your left and the field on your right. Follow this path as it bends round to the right, again keeping the hedgerow on your left and the field on your right, until you reach the fourth oak on your left. Here you will find a gate leading into the field. Go through the gate, cross a small footbridge, continue north-east through the field heading for another gate, go through, over a second wooden footbridge (it can be muddy after the bridge) and then another gate leading to the car park at The Woodman, Wildhill.